There's also a second smaller - but full length, zipped compartment on the front plus a third much smaller zipped compartment (for keys, gps) on the back. Unusually - there is no 'floating' lid. So - it's easily big enough for a sleeping bag plus some clothing and certainly big enough as a winter daypack. Shoulder straps are reasonably well padded as is the hip belt. There is only one back length available - it's not adjustable. I'm 5' 7'' with a longish back and I found that the overall pack length was just about ok for me but I would have preferred it to sit at little lower. Initially I found that the chest strap fastened too high - however, with a bit of investigation I found it was possible to move the chest strap anchor points which helped a lot with this. In use with a reasonably full load, I found that the backpack fitted quite closely to my back which made for a very stable load. However I did find that - despite the foam elevations on the back - perspiration didn't evaporate very quickly when the pack was on. (I do 'run hot' so this may be less of a problem for those who don't!) Overall, though I thought the Voltai was really quite comfortable. 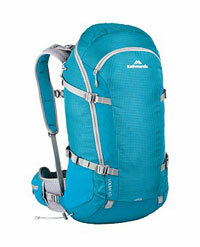 The fabric density is that used in many other lighter weight backpacks and does feel reasonably robust.